FIDE President, 1970-1978 In 1981, chess was added to the curriculum at Hunter College Elementary School in New York. In 1981, Jan Timman (1951- ) won the IBM International, held in Amsterdam. In 1981 Susan (Zsuzsa) Polgar (1969- ) was the winner of the first Women's Cadet (under 16) chess championship. 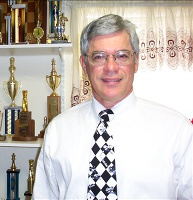 In 1981, Tim Redman was elected USCF president. He was president for two terms, 1981-1984 and 2000-2001, the only president to date who has served twice. In 1981, John Fedorowicz (1958- ) won the Manhattan Chess Club Championship. In 1981, Mitchell Saltzberg (1906-1986) won the Marshall Chess Club Championship. In 1981, Maia Chiburdanidze (1961- ) retained her title was world woman champion after an 8-8 tie with challenger Nana Alexandria. The match was played in Borjomi and Tbilisi. In 1981, John Jarecki (1969- ) became the youngest chess master in the US at the time, at age 12. In 1981, future grandmaster John Fedorowicz and grandmaster Andras Adorjan got into a fistfight at the Edward Lasker Memorial on New York. Fedorowicz was upset that Adorjan beat him when Adorjan was drawing all his earlier games. Most of the blows landed not on each other, but on the tournament director, Eric Schiller, who was trying to break up the fight. In 1981, Cray Blitz became the 1st computer program to win a state championship. It won the Mississippi State Championship with a perfect 5-0 score and a performance rating of 2258. In round 4 it defeated Joe Sentef (2262) to become the first computer to beat a master in tournament play and the first computer to gain a master rating (2258). In 1981 BELLE won the 12th ACM computer championship, held in Los Angeles. In 1981, John Grefe (1947-2013) won the California State championship. In 1981, standard notation (algebraic notation) was established by FIDE as the official notation. In 1981, Diane Savereide (1954- ) won the US women's championship. In January 1981, Ortvin Sarapu (1924-1999) won the New Zealand championship for the 16th time. On January 7, 1981, GM (2000) Krishnan Sasikiran was born in Chennai, India. On January 8, 1981, GM (1950) Alexander Kotov (1913-1981) died in Moscow at the age of 67. On February 14, 1981, Esteban Canal (1896-1981) died in Varese, Italy. He was Hungarian champion in 1933. He was awarded the IM title in 1950 and an honorary GM title in 1977. In March 1981, Viktor Korchnoi (1931-2016) won the last Lone Pine International Tournament. He showed up without notice, which gave no time for the two Soviet players, Romanishin and Yusupov, to drop out. At the time, there was a Soviet bloc not to have any Soviet chess players participate in a tournament that Korchnoi was participating in. On March 23, 1981, Edward Lasker (1885-1981), a distant cousin of world champion Emanuel Lasker, died at the age of 95. Edward Lasker was Paris Champion in 1912, London Champion in 1914, New York City Champion in 1915, the Chicago Champion in 1916, and won five U.S. Open events (1916, 1917, 1919, 1920, and 1921). On April 25, 1981, Ernst Ahman died in Sweden. He won the 1948 Swedish championship. On May 4, 1981 Italy issued a chess stamp depicting Living Chess. On May 4, 1981 Luxembourg issued a chess stamp to commemorate the 50th anniversary of the Luxembourg Chess Federation. On May 10, 1981, Peters Acs was born. He is a Hungarian GM and 2001 World Junior Chess Champion. On May 20, 1981, chess master David Gedult (1897-1981) died in Paris. On May 29, 1981, Frank Altschul died in Stamford, CT. He was a problem book publisher. On July 30, 1981, Walter Browne and Yasser Seirawan tied for 1st in the US championship, held in South Bend, Indiana. Each was awarded $4,500 and qualified for the Interzonal tournament. On August 2, 1981, Johann Breuer died in Reichshof, Germany. IJComp 1957; IMComp 1973. On August 3, 1981, Wolfgang Heidenfeld died in Ulm, Germany. He won the South African championship 8 times and the Irish championship 6 times. In August 1981, 5 tied for 1st place in the 82nd US Open, held in Palo Alto (704 players). Tied for 1st place were Florin Gheorghiu, Larry Christiansen, Jeremy Silman, Nick de Firmian, and John Meyer. On September 28, 1981, the 2nd world microcomputer championship was held in Travemunde, Germany. It was won by Fidelity X. On Sept 29, 1981, chess author Irving Chernev died in San Francisco. On September 30, 1981 Mongolia issued 7 chess stamps depicting chess pieces. On October 15, 1981 Djibouti issued two chess stamps showing Swedish and Chinese chess pieces. On October 24, 1981, chess master Alexander Kevitz died. On October 27, 1981, Lucius Endzelins died in Adelaide. He took 2nd in the World Correspondence Championship 1956-9. He was Australian champion in 1961. On November 12, 1981, GM (1952) Herman Pilnik (1914-1981) died in Caracas, Venezuela at the age of 67. On November 19, 1981 Karpov defeated Korchnoi, 11-7, in Merano, Italy and retained his world champion title. In November, 1981, Air Force Airman 1st Class Timothy Brown won the 22nd US Armed Forces championship. He won the Arizona championship in 1976. The Sea Services won the team championship. The event was held at the American Legion Hall of Flags in Washington, DC. In November 1981, Jack Watson and Nick deFirmian won the American Open (390 players). 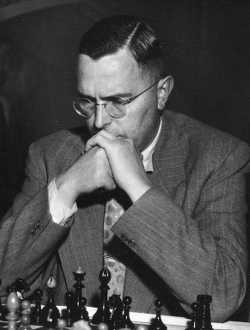 On November 26, 1981, GM (1950) Max Euwe (1901-1981) died of a heart attack in Amsterdam. He was Dutch champion 12 times. He was World Champion from 1935 to 1937. He was FIDE President from 1970 to 1978. In December 1981, Bill Wall was elected president of the Dayton Chess Club in Dayton, Ohio. It was the largest chess club in Ohio, with over 150 members. On December 22, 1981, Lev Psakhis and Garry Kasparov tied for 1st in the 49th USSR Chess Championship, held in Frunze. In December, 1981, Djibouti issued two chess stamps to commemorate the World Championship match in Merano. On December 31, 1981 Mali issued two chess stamps to commemorate the World Championship match in Merano.